Should workers fear increasing automation? 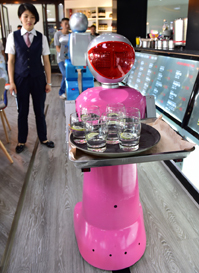 Robots and other forms of automation can be found not only on factory assembly lines but also in hospital operating rooms, behind car steering wheels, in offices and on Wall Street trading floors. What's more, some experts say, the capabilities of robots and intelligent machines — computers that can analyze data and act on it autonomously — are improving so rapidly that within 10 years machines could perform nearly half of the work done by humans, and more cheaply. Robotics proponents say automation will improve productivity, lower labor costs and make companies stronger and more competitive with overseas rivals. But automation critics fear robots will put many Americans out of work, cause social upheaval and disrupt entire economic sectors. Meanwhile, the legal system is scrambling to catch up with the fast-growing robotics sector, with experts expressing confusion over who should be responsible when robots go awry and cause physical or economic harm.